It's one thing to toss out a poorly-formed talking point. But when you cling to it for years, despite its obvious inanity, well, it says quite a lot about the speaker. Hussam Ayloush, head of the Council on American-Islamic Relations (CAIR) Los Angeles office, told us quite a lot about himself last week, when he again equated ISIS terrorists with the Israeli army. 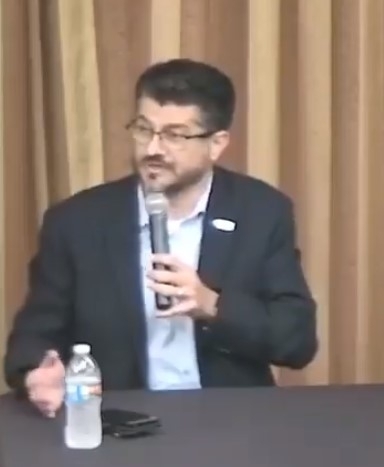 During a program at the Islamic Institute of Orange County on "Islamophobia" – a form of bigotry – Ayloush complained about Countering Violent Extremism (CVE) programs he said unjustly target Muslims, the Algemeiner reported Thursday. There's no similar focus on white communities, he said in a video highlighted by the Middle East Media Research Institute (MEMRI). "You know how many hundreds of Jewish American kids are recruited to join the Israeli occupation army? Hundreds. Every year. They leave their country, leave America, to go join with an army that is engaged, with no debate, in major violations of human rights, and maybe some would argue, and I'm one of them, war crimes." "No one has ever established a CVE program to see, why would normal Jewish American kids leave their home and join to be part of an army committing war crimes." This is so idiotic it shouldn't require an explanation. But there are some elementary differences which Ayloush pretends do not exist. ISIS recruits will tell anyone who asks that they tried to join in order to kill – be it in defense of Muslims from external threats, infidels, or anyone who gets in the way. And they pose a legitimate threat to the United States if they return home, or if they fail to make it overseas and decide to strike here. If American Jews were on record saying they were going to join the Israel Defense Forces (IDF) specifically to slaughter Palestinians, then Ayloush might have a point. But that's not why American Jews have joined. Because of its size and the nature of the threats against it, military service is compulsory for most young men and women. If you want to live in Israel, you serve. That context is something a sentient being like Ayloush should be aware of, but it is not one that helps his hate-driven comparison. And it's not new. "You know, you don't hear about countering violent extremism to deal with the thousands of Jewish-American kids who join the Israeli army killing the people of Gaza. When was the last time the DHS – the Dept. of Homeland Security – or the FBI approached the Jewish community to ask them to deal with this trend? Actually, there are many more Jewish Americans who have joined the Israeli army than there are Muslim Americans who join ISIS." How does one equate a functioning democratic state, one which routinely warns people to vacate an area before an airstrike, in which its Arab citizens have greater individual rights to choose their representatives than most of the Muslim world, with a death cult that seems to work overtime to kill in the most shocking and depraved ways imaginable? Given his repeated claim, other options might now include stupidity and deliberate deception. In last week's discussion, Ayloush blamed the "Islamophobia industry" for telling Americans Muslims are bad and pushing policies to hurt them. "Let's push for bullying," he said as an example. He then claimed polling shows 60 to 67 percent Americans have negative views of Islam. That is a significant exaggeration, the latest Pew polling shows, and the trend is moving toward more favorable attitudes. But "things are getting better" isn't a great message for an "Islamophobia" program. Ask Ayloush about Hamas and he'll show you another way he cons his audiences. In 2013, he reacted angrily and defensively to the question of whether Hamas is a terrorist organization. CAIR is a civil rights organization, he said, and "we're not here in the business of being dragged into the Middle East affairs and the conflicts of the Middle East." No dragging was needed to get CAIR and its leaders to opine on recent turmoil involving Israel and Palestinians. 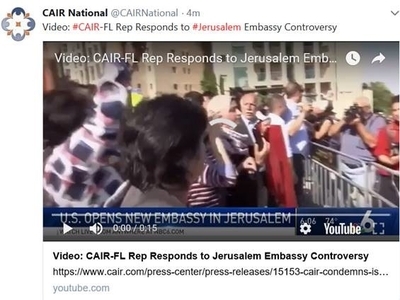 CAIR's national Twitter feed promoted a television interview its Florida spokesman, Wilfredo Ruiz, gave condemning the opening of the U.S. Embassy in Jerusalem. It has "absolutely no purpose in our foreign policy," he said. "Why are we doing this? How does this benefit the United States of America?" And CAIR Executive Director Nihad Awad, a man with a direct connection to a U.S.-based Hamas support network, was quick to accuse Israel of a "massacre" at the Gaza-Israel border earlier this month. If it happened in the United States, Awad told a Baltimore television station, "the world would be up in flame." Two days later, a senior Hamas official claimed that the overwhelming majority of those killed were Hamas fighters. CAIR hasn't said much about that. To recap, when challenged to acknowledge or deny Hamas's terrorist mission, Ayloush says that CAIR is a simple American civil rights organization that shouldn't be dragged into Middle East conflicts. But he and other CAIR leaders think the Israel Defense Forces are on par with ISIS. And when Palestinians die, CAIR officials are eager to be on camera to condemn Israel. That's a con game in action. And it works. 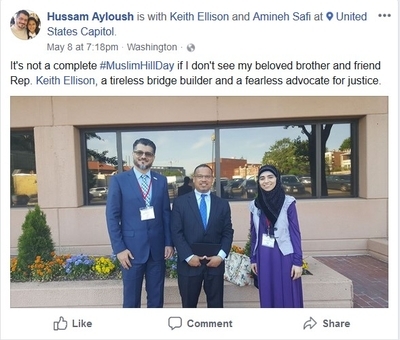 Ayloush remains politically influential, posing for a picture with Congressman Keith Ellison May 8 during a Capitol Hill lobbying push. Ellison, of course, privately espouses a belief that Israel controls U.S. foreign policy. Meanwhile, news reporters either are ignorant about CAIR's roots or prefer not to ask the kinds of questions about Hamas that set Ayloush off. The next time he wants to be on somebody's air, they should ask him to defend his ignorant and hateful comparison. Update: Ayloush again has company within CAIR in arguing ISIS and the IDF are morally equivalent. Zahra Billoo, head of the CAIR San Francisco office, took to Twitter Friday afternoon to say she doesn't see a "difference between American youth leaving the country to join ISIS or the IDF. Both are murderous, war crime committing, terrorist entities." Billoo also pushed the same argument back in 2015, repeatedly asking, "who has recruited more Americans? The IDF or ISIS?" Ayloush and Billoo run two of the most prominent CAIR chapters.